Die Martis, videlicet, 19 Julii. Lady Maltravers's Horses may be sent to France. Message to the H. C. with the Order empowering the Committee of Safety to dispose of the Arms from Hull. E. of Warwick's Letter to the Speaker, sending up Captains Slingsby and Wake as Delinquents. Both committed to the Gentleman Usher. Earl of Holland's Possessions in Windsor Park quieted. Col. Butler to be allowed a Maintenance. To be released, upon Sureties for the Peace, at the Request of the Earl of Northumberland. To proceed in it on Friday. Message from the H. C. about the Alterations made by the King in the Treaty with the Scots. The Examination of Edm. Muschamp, about threatening Words against the Earl of Northumberland. Bridge's Affidavit against Marston, about Words against the Parliament. Order for 1000l to be paid to Sir John Clatworthy, in Part of his Entertainment in Ireland. Order for 10,000l. impressed unto Mr. Loftus, to be employed for Ireland. Lord Mayor's Answer to the Impeachment of the House of Commons. Indemnity for the Hertford Voluntiers. Indemnity for the Shrewsbury Voluntiers. The House being informed, "That, the Lady Maltravers being going into France for her Health, her Coach-horses are stayed at Rye:" Ordered, That they be released, and suffered to be transported into France. To desire their Lordships to determine some Time in the Matter of the Conference the other Day, concerning the removing some Forces out of Ulster and Lempster, for the reducing of Lymericke. Agreed to it, with Addition of the Words ["for "Ireland"]. 3. An Order of Indemnity of Voluntiers at Hertford. 4. An Order that Sir Jo. Clattworthy shall subscribe for One Thousand Pounds. Agreed to, with the Addition of these Words ["for "Ireland"]. That this House agrees with the House of Commons in the Two Orders for the Indemnity; and concerning the Orders for the Ten Thousand Pounds, and One Thousand Pounds to be paid to Sir Jo. Clattworthy, this House will send an Answer, by Messengers of their own; and concerning the drawing of Forces into Munster, their Lordships will take the same into speedy Consideration. 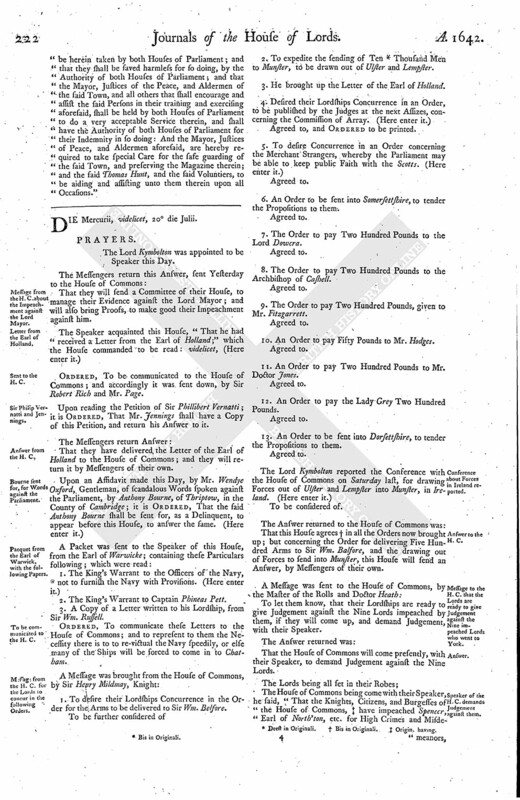 To desire their Concurrence in an Order made the 16th of this Instant July, to give the Committee for the Safety of the Kingdom Power to dispose of the Arms and Ammunition that came from Hull. That they have delivered the Order to the House of Commons; who will send Answer, by Messengers of their own. A Letter was read, written to the Speaker of this House. From aboard The James, in The Downes, this 18 of July, 1642. Ordered, That Captain Slyngsby and Captain Wake shall be committed to the safe Custody of the Gentleman Usher attending this House, until the further Pleasure of this House be further known; and the Speaker to write the Earl of Warwicke Thanks for the same. Upon reading the Petition of Francis Young, in the Behalf of the Earl of Holland; it is Ordered, That nothing shall be done to the Prejudice of the Earl of Holland, in the Disturbance of his Possession in the Walks of the Great Park at Windsor, until his Lordship return out of the North; and then, if his Lordship will claim his Privilege, he is to be allowed it. Ordered, That the Earl of Bedford, General of the Horse, shall be added to the Committee for the Safety of the Kingdom. Upon reading the Petition of Colonel Butler; it is Ordered, To have a Conference with the House of Commons, about allowing him somewhat for his Maintenance; in the mean Time, the Clerk of the Crown shall pay him Five Pounds out of the Money for Contribution. The Lord Mayor being come, to put in his Answer to the Impeachment of the House of Commons; the House Resolved, To send to the House of Commons, to give them Notice of it. And a Message was sent down to the House of Commons, to let the House of Commons know, that the Lord Mayor is come, to put in his Answer to the Impeachment brought up from them; and, if they will, they may send up a Committee, to hear his Answer. Further his Lordship reported, "That he hath enquired after his Reputation and good Carriage in the Place where he lives, and he hath a good Report; that he goes constantly to Church, and is of civil Conversation, but a Man of no great Judgement nor Discretion, and of weak Understanding." Hereupon the Earl of Northumberland stood up, and desired the House, "That, seeing these Words proceeded from the Indiscretion and weak Understanding of the said Edmund Muschamp, whom his Lordship hath been informed by the best of the Parish where he liveth that he is of a good Conversation, that their Lordships would release him from his Imprisonment, and proceed no further against him for what concerns him:" And, upon the Request of the Earl of Northumberland, it is Ordered, That the said Edmund Muschamp shall be released of his Imprisonment for this Business; first putting in, before the Lord Chief Justice, good and sufficient Sureties to be bound for him, for the good Behaviour. That the House of Commons will send a Committee, to hear the Lord Mayor's Answer. The Committee of the House of Commons being come, the Lord Mayor was brought in, by the Gentleman of the Black Rod, as a Delinquent; and, kneeling until the Speaker bid him stand up, the Speaker told him, "That this was the Day appointed for him to put in his Answer to the further and additional Impeachment of the House of Commons; and demanded whether he had brought it." Then the Committee and the Lord Mayor withdrew. And it is Ordered, That this House will proceed against the Lord Mayor on Friday next, upon both the Impeachments; and the House of Commons are then to produce all their Proofs, to prove the said Impeachments. A Message was sent to the House of Commons, to acquaint them with the abovesaid. Then this House proceeded to judge the Nine Lords that are impeached. 1. 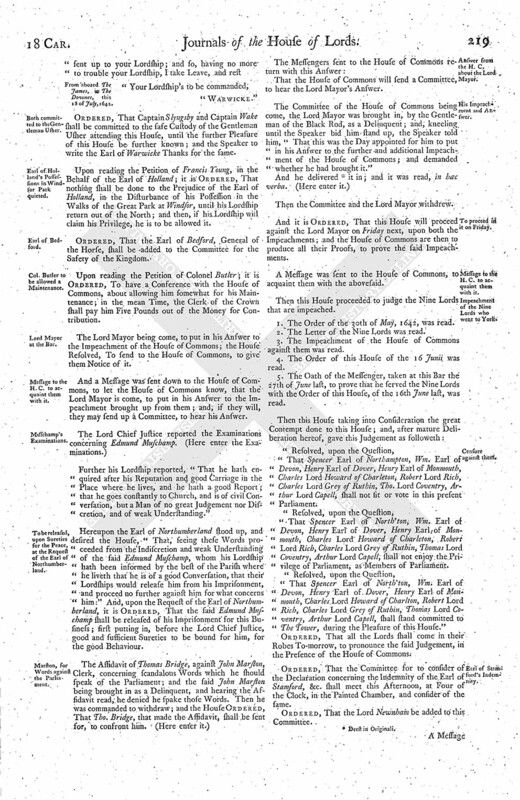 The Order of the 30th of May, 1642, was read. 2. The Letter of the Nine Lords was read. 3. The Impeachment of the House of Commons against them was read. 4. The Order of this House of the 16 Junii was read. 5. The Oath of the Messenger, taken at this Bar the 27th of June last, to prove that he served the Nine Lords with the Order of this House, of the 16th June last, was read. That Spencer Earl of Northampton, Wm. Earl of Devon, Henry Earl of Dover, Henry Earl of Monmouth, Charles Lord Howard of Charleton, Robert Lord Rich, Charles Lord Grey of Ruthin, Tho. Lord Coventry, Arthur Lord Capell, shall not sit or vote in this present Parliament. That Spencer Earl of North'ton, Wm. Earl of Devon, Henry Earl of Dover, Henry Earl of Monmouth, Charles Lord Howard of Charleton, Robert Lord Rich, Charles Lord Grey of Ruthin, Thomas Lord Coventry, Arthur Lord Capell, shall not enjoy the Privilege of Parliament, as Members of Parliament. That Spencer Earl of North'ton, Wm. Earl of Devon, Henry Earl of Dover, Henry Earl of Monmouth, Charles Lord Howard of Charlton, Robert Lord Rich, Charles Lord Grey of Ruthin, Thomas Lord Coventry, Arthur Lord Capell, shall stand committed to The Tower, during the Pleasure of this House." Ordered, That all the Lords shall come in their Robes To-morrow, to pronounce the said Judgement, in the Presence of the House of Commons. Ordered, That the Committee for to consider of the Declaration concerning the Indemnity of the Earl of Stamford, &c. shall meet this Afternoon, at Four of the Clock, in the Painted Chamber, and consider of the same. Ordered, That the Lord Newnham be added to this Committee. To let their Lordships (fn. 2) know, That they having received the Treaty with the Scotts from their Lordships, wherein are certain Alterations made by the King, the House of Commons have taken them into Consideration, and have agreed to some, but cannot agree to the rest. 1. That this House doth agree to the Alteration in the Third Article. 2. 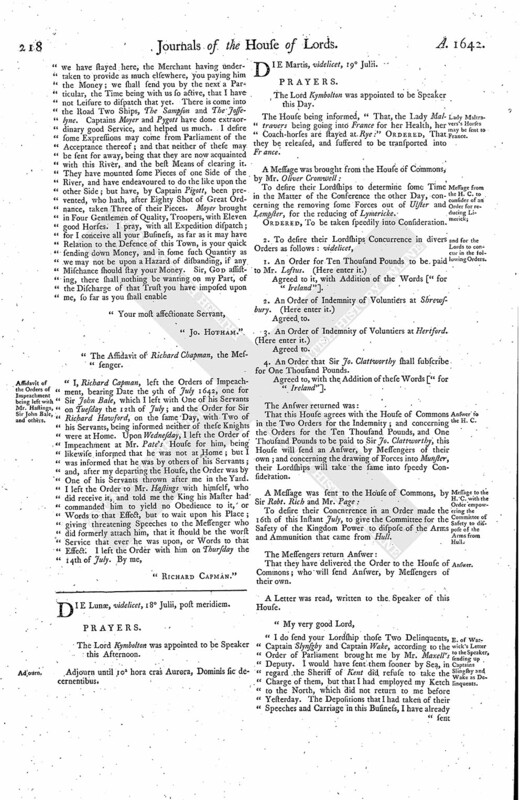 The Alteration in the Sixth Article; videlicet, ["and Parliament of England"], being put to the Question, passed with the Negative. 3. 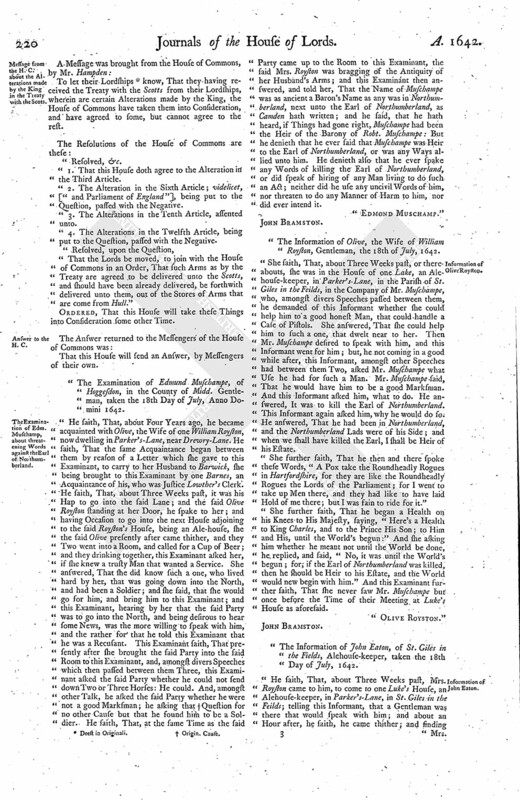 The Alterations in the Tenth Article, assented unto. 4. 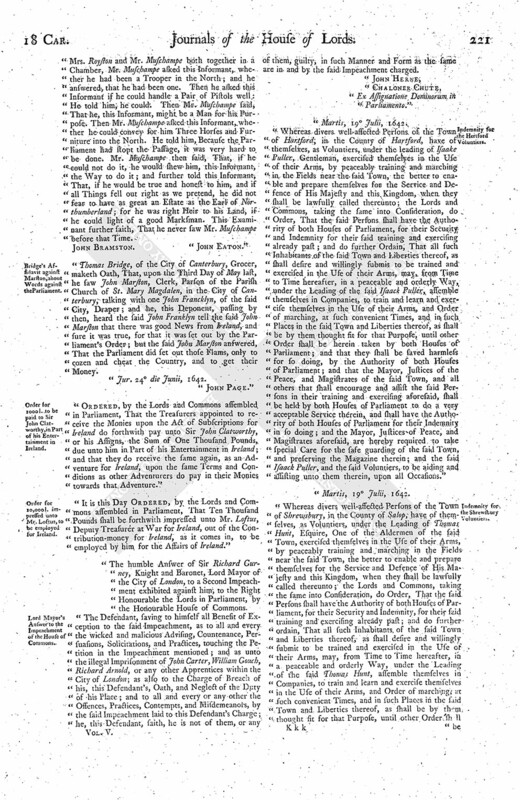 The Alterations in the Twelfth Article, being put to the Question, passed with the Negative. "That the Lords be moved, to join with the House of Commons in an Order, That such Arms as by the Treaty are agreed to be delivered unto the Scotts, and should have been already delivered, be forthwith delivered unto them, out of the Stores of Arms that are come from Hull." Ordered, That this House will take these Things into Consideration some other Time. The Examination of Edmund Muschampe, of Hoggesdon, in the County of Midd. Gentleman, taken the 18th Day of July, Anno Domini 1642. He saith, That, about Four Years ago, he became acquainted with Olive, the Wife of one William Royston, now dwelling in Parker's-Lane, near Drewry-Lane. He saith, That the same Acquaintance began between them by reason of a Letter which she gave to this Examinant, to carry to her Husband to Barwick, she being brought to this Examinant by one Barnes, an Acquaintance of his, who was Justice Lowther's Clerk. He saith, That, about Three Weeks past, it was his Hap to go into the said Lane; and the said Olive Royston standing at her Door, he spake to her; and having Occasion to go into the next House adjoining to the said Royston's House, being an Ale-house, she the said Olive presently after came thither, and they Two went into a Room, and called for a Cup of Beer; and they drinking together, this Examinant asked her, if she knew a trusty Man that wanted a Service. She answered, That she did know such a one, who lived hard by her, that was going down into the North, and had been a Soldier; and she said, that she would go for him, and bring him to this Examinant; and this Examinant, hearing by her that the said Party was to go into the North, and being desirous to hear some News, was the more willing to speak with him, and the rather for that he told this Examinant that he was a Recusant. This Examinant saith, That presently after she brought the said Party into the said Room to this Examinant, and, amongst divers Speeches which then passed between them Three, this Examinant asked the said Party whether he could not send down Two or Three Horses: He could. And, amongst other Talk, he asked the said Party whether he were not a good Marksman; he asking that (fn. 3) Question for no other Cause but that he found him to be a Soldier. He saith, That, at the same Time as the said Party came up to the Room to this Examinant, the said Mrs. Royston was bragging of the Antiquity of her Husband's Arms; and this Examinánt then answered, and told her, That the Name of Muschampe was as ancient a Baron's Name as any was in Northumberland, next unto the Earl of Northumberland, as Camden hath written; and he said, that he hath heard, if Things had gone right, Muschampe had been the Heir of the Barony of Robt. Muschampe: But he denieth that he ever said that Muschampe was Heir to the Earl of Northumberland, or was any Ways allied unto him. He denieth also that he ever spake any Words of killing the Earl of Northumberland, or did speak of hiring of any Man living to do such an Act; neither did he use any uncivil Words of him, nor threaten to do any Manner of Harm to him, nor did ever intend it. The Information of Olive, the Wife of William Royston, Gentleman, the 18th of July, 1642. She saith, That, about Three Weeks past, or thereabouts, she was in the House of one Lake, an Alehouse-keeper, in Parker's-Lane, in the Parish of St. Giles in the Feilds, in the Company of Mr. Muschampe, who, amongst divers Speeches passed between them, he demanded of this Informant whether she could help him to a good honest Man, that could handle a Case of Pistols. She answered, That she could help him to such a one, that dwelt near to her. Then Mr. Muschampe desired to speak with him, and this Informant went for him; but, he not coming in a good while after, this Informant, amongst other Speeches had between them Two, asked Mr. Muschampe what Use he had for such a Man. Mr. Muschampe said, That he would have him to be a good Marksman. And this Informant asked him, what to do. He answered, It was to kill the Earl of Northumberland. This Informant again asked him, why he would do so. He answered, That he had been in Northumberland, and the Northumberland Lads were of his Side; and when we shall have killed the Earl, I shall be Heir of his Estate. "She further saith, That he then and there spoke these Words, "A Pox take the Roundheadly Rogues in Hartfordshire, for they are like the Roundheadly Rogues the Lords of the Parliament; for I went to take up Men there, and they had like to have laid Hold of me there; but I was fain to ride for it." She further saith, That he began a Health on his Knees to His Majesty, saying, "Here's a Health to King Charles, and to the Prince His Son; to Him and His, until the World's begun:" And she asking him whether he meant not until the World be done, he replied, and said, "No, it was until the World's begun; for; if the Earl of Northumberland was killed, then he should be Heir to his Estate, and the World would new begin with him." And this Examinant further saith, That she never saw Mr. Muschampe but once before the Time of their Meeting at Luke's House as aforesaid. The Information of John Eaton, of St. Giles in the Fields, Alehouse-keeper, taken the 18th Day of July, 1642. He saith, That, about Three Weeks past, Mrs. Royston came to him, to come to one Luke's House, an Alehouse-keeper, in Parker's-Lane, in St. Giles in the Feilds; telling this Informant, that a Gentleman was there that would speak with him; and about an Hour after, he saith, he came thither; and finding Mrs. Royston and Mr. Muschampe both together in a Chamber, Mr. Muschampe asked this Informant, whether he had been a Trooper in the North; and he answered, that he had been one. Then he asked this Informant if he could handle a Pair of Pistols well: He told him, he could. Then Mr. Muschampe said, That he, this Informant, might be a Man for his Purpose. Then Mr. Muschampe asked this Informant, whether he could convey for him Three Horses and Furniture into the North. He told him, Because the Parliament had stopt the Passage, it was very hard to be done. Mr. Muschampe then said, That, if he could not do it, he would shew him, this Informant, the Way to do it; and further told this Informant, That, if he would be true and honest to him, and if all Things fell out right as we pretend, he did not fear to have as great an Estate as the Earl of Northumberland; for he was right Heir to his Land, if he could light of a good Marksman. This Examinant further saith, That he never saw Mr. Muschampe before that Time. Thomas Bridge, of the City of Canterbury, Grocer, maketh Oath, That, upon the Third Day of May last, he saw John Marston, Clerk, Parson of the Parish Church of St. Mary Magdalen, in the City of Canterbury, talking with one John Francklyn, of the said City, Draper; and he, this Deponent, passing by then, heard the said John Franklyn tell the said John Marston that there was good News from Ireland, and sure it was true, for that it was set out by the Parliament's Order; but the said John Marston answered, That the Parliament did set out those Flams, only to cozen and cheat the Country, and to get their Money. "Jur. 24 die Junii, 1642. "Ordered, by the Lords and Commons assembled in Parliament, That the Treasurers appointed to receive the Monies upon the Act of Subscriptions for Ireland do forthwith pay unto Sir John Clatworthy, or his Assigns, the Sum of One Thousand Pounds, due unto him in Part of his Entertainment in Ireland; and that they do receive the same again, as an Adventure for Ireland, upon the same Terms and Conditions as other Adventurers do pay in their Monies towards that Adventure." "It is this Day Ordered, by the Lords and Commons assembled in Parliament, That Ten Thousand Pounds shall be forthwith impressed unto Mr. Loftus, Deputy Treasurer at War for Ireland, out of the Contribution-money for Ireland, as it comes in, to be employed by him for the Affairs of Ireland. "The humble Answer of Sir Richard Gurney, Knight and Baronet, Lord Mayor of the City of London, to a Second Impeachment exhibited against him, to the Right Honourable the Lords in Parliament, by the Honourable House of Commons. "The Defendant, saving to himself all Benefit of Exception to the said Impeachment, as to all and every the wicked and malicious Advising, Countenance, Persuasions, Solicitations, and Practices, touching the Petition in the Impeachment mentioned; and as unto the illegal Imprisonment of John Carter, William Gouch, Richard Arnold, or any other Apprentices within the City of London; as also to the Charge of Breach of his, this Defendant's, Oath, and Neglect of the Duty of his Place; and to all and every or any other the Offences, Practices, Contempts, and Misdemeanors, by the said Impeachment laid to this Defendant's Charge; he, this Defendant, saith, he is not of them, or any of them, guilty, in such Manner and Form as the same are in and by the said Impeachment charged. "Ex Assignatione Dominorum in Parliamento." "Whereas divers well-affected Persons of the Town of Hartford, in the County of Hartford, have of themselves, as Voluntiers, under the leading of Isaake Puller, Gentleman, exercised themselves in the Use of their Arms, by peaceably training and marching in the Fields near the said Town, the better to enable and prepare themselves for the Service and Defence of His Majesty and this Kingdom, when they shall be lawfully called thereunto; the Lords and Commons, taking the same into Consideration, do Order, That the said Persons shall have the Authority of both Houses of Parliament, for their Security and Indemnity for their said training and exercising already past; and do further Ordain, That all such Inhabitants of the said Town and Liberties thereof, as shall desire and willingly submit to be trained and exercised in the Use of their Arms, may, from Time to Time hereafter, in a peaceable and orderly Way, under the Leading of the said Isaack Puller, assemble themselves in Companies, to train and learn and exercise themselves in the Use of their Arms, and Order of marching, at such convenient Times, and in such Places in the said Town and Liberties thereof, as shall be by them thought fit for that Purpose, until other Order shall be herein taken by both Houses of Parliament; and that they shall be saved harmless for so doing, by the Authority of both Houses of Parliament; and that the Mayor, Justices of the Peace, and Magistrates of the said Town, and all others that shall encourage and assist the said Persons in their training and exercising aforesaid, shall be held by both Houses, of Parliament to do a very acceptable Service therein, and shall have the Authority of both Houses of Parliament for their Indemnity in so doing; and the Mayor, Justices of Peace, and Magistrates aforesaid, are hereby required to take special Care for the safe guarding of the said Town, and preserving the Magazine therein; and the said Isaack Puller, and the said Voluntiers, to be aiding and assisting unto them therein, upon all Occasions. "Whereas divers well-affected Persons of the Town of Shrewsbury, in the County of Salop, have of themselves, as Voluntiers, under the Leading of Thomas Hunt, Esquire, One of the Aldermen of the said Town, exercised themselves in the Use of their Arms, by peaceably training and marching in the Fields near the said Town, the better to enable and prepare themselves for the Service and Defence of His Majesty and this Kingdom, when they shall be lawfully called thereunto; the Lords and Commons, taking the same into Consideration, do Order, That the said Persons shall have the Authority of both Houses of Parliament, for their Security and Indemnity, for their said training and exercising already past; and do further ordain, That all such Inhabitants of the said Town and Liberties thereof, as shall desire and willingly submit to be trained and exercised in the Use of their Arms, may, from Time to Time hereafter, in a peaceable and orderly Way, under the Leading of the said Thomas Hunt, assemble themselves in Companies, to train and learn and exercise themselves in the Use of their Arms, and Order of marching at such convenient Times, and in such Places in the said Town and Liberties thereof, as shall be by them thought fit for that Purpose, until other Order shall be herein taken by both Houses of Parliament; and that they shall be saved harmless for so doing, by the Authority of both Houses of Parliament; and that the Mayor, Justices of the Peace, and Aldermen of the said Town, and all others that shall encourage and assist the said Persons in their training and exercising aforesaid, shall be held by both Houses of Parliament to do a very acceptable Service therein, and shall have the Authority of both Houses of Parliament for their Indemnity in so doing: And the Mayor, Justices of Peace, and Aldermen aforesaid, are hereby required to take special Care for the safe guarding of the said Town, and preserving the Magazine therein; and the said Thomas Hunt, and the said Voluntiers, to be aiding and assisting unto them therein upon all Occasions."